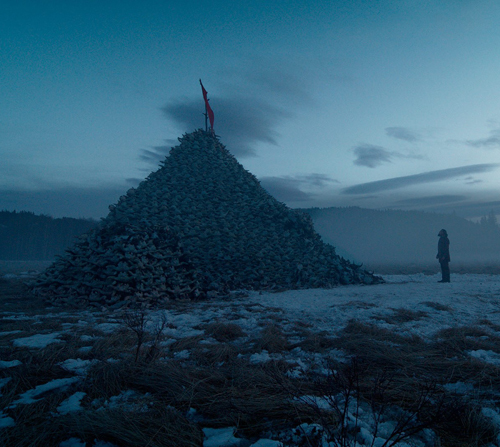 The Revenant is absolutely beautiful to behold; it’s just not a great film. 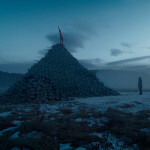 Cinematographer Emmanuel Lubezki may very well win his third consecutive Oscar – following Gravity and Birdman, working with director Alejandro González Iñárritu to create a string of poster-perfect and desktop-background-worthy shots. All that’s lost in the striking milieu is resonance with the harrowing tale of survival and revenge that plays out in front of the backdrop. Inspired by actual events, the collection of impeccably lensed images follows Hugh Glass (Leonardo DiCaprio), a guide on a fur trapping expedition in the 1820s. 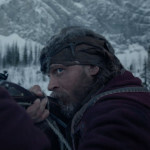 After his hunting party is besieged by a native tribe searching for kidnapped girl, Glass and a handful of others – including leader Andrew Henry (Domhnall Gleeson), selfish brute John Fitzgerald (Tom Hardy), and Glass’ half-native son Hawk (Forrest Goodluck) – set out for a far-off fort. After Glass is mauled and terribly wounded by a protective mama bear, he’s left behind with his son, inexperienced hunter Bridger (Will Poulter), and Fitzgerald (probably not a good choice). Eager to free himself from watching over Glass, Fitzgerald promptly kills Hawk, leaves Glass to die, lies to Bridger about attacking natives, and gets outta Dodge. Only Glass doesn’t die. Possessing keen survival skills and buoyed by a thirst for vengeance, he crawls from his shallow grave and gives slow chase. 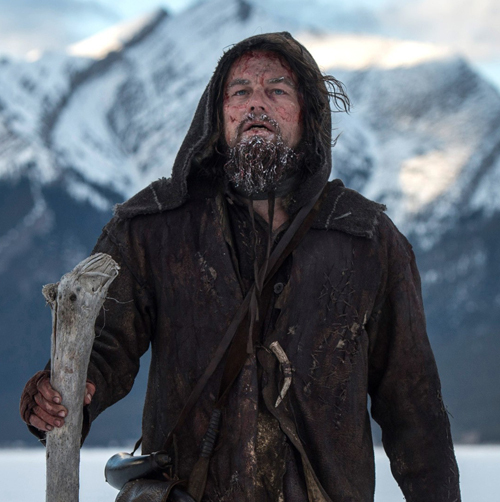 The wilderness of The Revenant is an unforgiving oppressor. The grime of the forest floor, the chill of the mountain rivers, and the severity of craggy cliffs are palpable, due in no small part to the film’s arduous shoot involving remote locations and a strict use of natural light sources. While the mercilessness of the landscape pops, artificiality creeps in with Iñárritu’s aggrandizing. His long take of the battle between the trappers and the natives is a technical achievement that loses a bit of the brutality in the way it’s staged. Once we figure out that anyone being followed by the camera for more than a few seconds will soon get an arrow through the throat or be knocked from their horse by a musket, the immediacy is lost. The craft drains the bloody carnage of tension, replacing it with pretense. In contrast, the bear attack completely works. 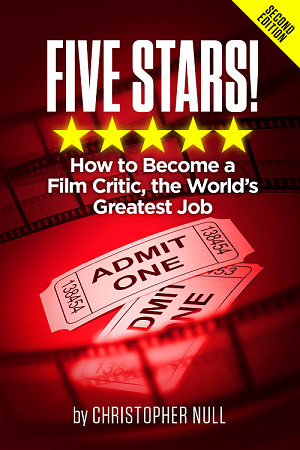 It’s a long, continuous take that’s relentlessly ferocious, gory, and squirm-inducing. We’re on edge as the beast whips Glass around like a ragdoll and are at the mercy of the moment. It’s a relief when it ends, but as the tribulations of the journey deepen, we yearn for similar stakes and more effective shocks. No matter how many raw bison livers Glass eats, how much self-surgery he performs, or how many trying nights he faces (including blizzards and a cold evening spent sleeping in the belly of an eviscerated horse), there’s an impersonal feel to the pain. Instead of feeling like moments of overcoming or enduring, the trials are elaborate detours on the road to the inevitable. Flashbacks and visions of Glass’ lost love as an ethereal, motivating figure add to the mechanical propulsion of the stark narrative. Disparate forays checking in on Fitzgerald and the other trappers, as well as the natives’ attempts at a rescue, do little to add color or connective tissue – aside from a few convenient story coincidences, to the journey. The frontier is a place full of unrelenting misery, and it’s hard to engage with the characters operating in the muck when their only characteristics are varying levels of horribleness or suffering. DiCaprio fully gives himself over to the grime, but the constant straining doesn’t require much range beyond grunts and shivers, and the longer he plods along, the more every tic starts to look the same. Hardy is a commanding presence as usual. He’s also trying on a new accent that makes him nearly unintelligible again, but even though we don’t always understand Fitzgerald we know where he’s coming from. Perhaps it’s also easy for him to stand out because he’s the only one who consistently strings together more than a few words of dialogue (clear or not) when he’s onscreen. In the final scene, a wide-eyed character turns for a near-direct gaze into the camera as if the void is staring back at us, urging some sort of response. But there’s nothing of substance to respond to. A film overly designed to distress doesn’t earn our despair or quiet reflection. 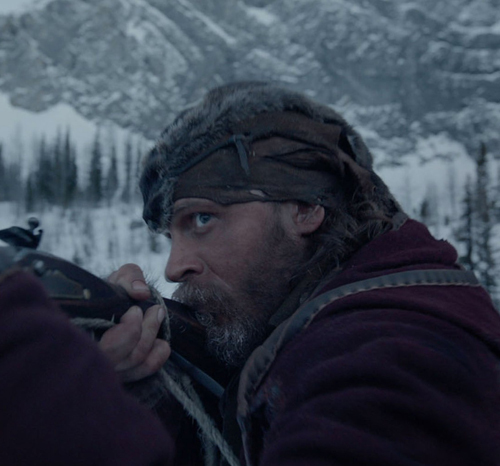 The major accomplishments of The Revenant are its extraordinary cinematography and its ability to try our patience.